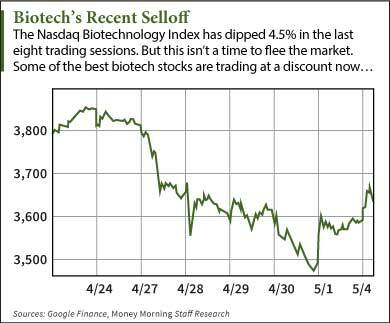 The biotech market sold off last week, with the Nasdaq Biotechnology Index dropping 4.5% since April 23. That means some of the best biotech stocks have dipped as well. "The sell-off we're seeing now seems to happen every year at about this time, like clockwork," Tremblay said on March 27. "There are always things going on in the news that seem to explain the drop, but the meta-picture is simply this: The market breathes in, and the market breathes out." Instead of selling, this is the time to go shopping for the best biotech stocks. The first biotech stock we're recommending is Biogen Inc. (Nasdaq: BIIB). That stock has gone "on sale," dipping 7.9% since April 23. Biogen is best known for Betaseron, the first FDA-approved drug that treated multiple sclerosis (MS). But the company has other drugs in its MS pipeline. 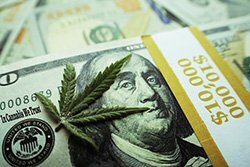 In Q1, sales from the company's MS division totaled $2.1 billion compared to $1.7 billion last year. Biogen is now getting a chance to explore MS more thoroughly. In early 2015, Biogen announced a partnership with Google Inc. (Nasdaq: GOOG, GOOGL). 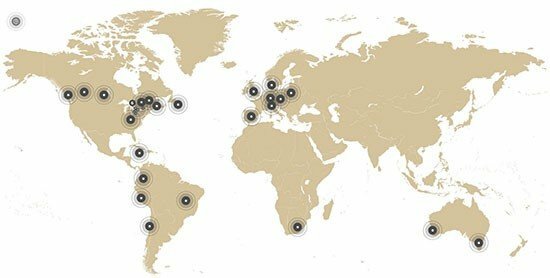 The two firms have created futuristic labs that use sensors, software, and data analysis to conduct better treatment research. "Earlier, Biogen had initiated a project with Fitbit, using the company's activity trackers to gather data on MS patients," Money Morning's Defense and Tech Specialist Michael Robinson said. "The Google partnership is an extension of that kind of thinking – using sensors to track the real-time medical data and also analyze all the Big Data to look for clues in treating and getting ahead of MS."
Biogen is developing a drug called Aducanumab to treat Alzheimer's. More than 75 million people worldwide are expected to be impacted by Alzheimer's by 2030. In March, the company reported Aducanumab was the first drug to show evidence of significantly slowing the signs of Alzheimer's. The drug will begin phase 3 trials this year, so there's no guarantee it will be approved. But this month's news did show the drug's enormous potential. BIIB stock is now trading around $375 per share after this week's decline.